With each desperate, awkward swing I feel I’m getting closer and closer to the target. But my flailing arms fall in wider and wider arcs. My bludgeon, the pen that I once thought was mightier than the sword, no longer even skims the elusive edge of the piñata that is my PhD topic. At this rate, I’ll never refine my PhD question, let alone finish the thesis itself. And so it seems, a year into the process, that I’m doomed to the intellectual spiral of getting closer and closer to The Perfect Question without actually arriving at it. This is significant and worrying because doing a PhD in the humanities in Australia means I have to come up with my own question. I don’t have the luxury of having one devised for me by my faculty or the research project director. Instead, I must tinker and twiddle and tweak my own ideas into something resembling a respectable question to spend three or more years answering. Of course I had to come up with a question when I applied for my PhD program. That wasn’t difficult. Back then I was so ignorant of my chosen research field that any proposal I put together would invariably sound brilliant to my naïve ears. Now, more than twelve months on, I know better. And that knowledge burdens me so heavily I can scarcely swing at my metaphorical piñata with confidence or accuracy. The PhD question, you see, is an elusive thing. It’s an intellectual horizon; the closer you approach, the further it recedes. The more I read (and read and read and read and read and read) about my subject, the more detail and controversy appears from which I could fashion a specific, unique, significant question. Which, naturally, makes it all the more difficult to select one! I won’t bore you with the details of my actual research area, but suffice it to say I feel like I’m in the Department of Life, The Universe, And Everything, and have chosen the rather broad but nonetheless noble topic of World Peace. My initial PhD application was some impressively worded guff about a hunch I had that more hugs in the world will make everyone more peaceful. Now I need to create a methodology that interrogates the nexus of hug-giving, hug-receiving and incidence of warfare since the invention of the hug in 703BC. Then I need to decide whether my thesis will be titled ‘Statistical regression modelling of war ameliorating properties of human-to-human non-sexual physical contact’ or do I want it to be ‘Guerrillas in the mist of tears; practical applications of hugging for counter-insurgency’. And how do I incorporate the fascinating but possibly irrelevant topic of tree-hugging?! Apart from the insanity-inducing back-and-forth about the exact wording of my PhD question, my metaphorical piñata is also one of Meaning, capital-M. My question – and yours, and everyone else’s who has ever done a PhD – needs to solve all the world’s problems in approximately 80,000 words. Doesn’t it? I mean, why else write a thesis. Right? It’s there to shift paradigms; to re-write policy; to offer game-changing insights. The temptation is certainly there to create something monumental. A PhD, after all, is supposed to add to the sum of human knowledge. That seems like a pretty large – and humbling – task. But maybe I shouldn’t be as hard on myself as I am on that imaginary piñata? Maybe it doesn’t really matter than much, in the grand scheme of things, if I take a post-structuralist-hug approach or the formalist hug theory to deconstructing World Peace. Maybe nobody outside some dank politics department will care. Or maybe at this level, with everything I have learned and experienced, it makes little difference because whatever I apply my analytical attentions to will be unique. Useful. Profound. Worthwhile. Groundbreaking, even. With my confidence restored, I swing again. It is now almost irrelevant where exactly my hits land – slightly to the left, slightly to the right – because it is all relevant and important, provided I then pursue the question I land on with vigour and intellectual integrity. How about you? Have you found the Perfect Question yet? Or are you still swinging? love this post – I’m swinging away wildly, getting closer and closer…. to what, exactly?! It’s great to be reminded that pretty much whatever I land on, it’s going to be something worth doing. Good post. I have this problem to an extent. I let it go, though, as I’m an incorrigible generalist and when the time comes all that knowledge will hopefully coalesce into a coherent single point. Start wide and narrow down is the approach that I think is most enjoyable and rewarding. I enjoyed this post especially as I’m 18 months in and was thinking today I should return to my research question to see if I was any closer to defining it. I highly recommend “Salsa Dancing into the Social Sciences” by Kristin Luker (2010) which takes you through converting your research interest into a research question (as well as how to recognise a faux-research question). Short point though is, you won’t have it completely sorted until you’ve done the research but you shouldn’t forget that you need to continually return to it to see if you have got there yet. Don’t you start your PhD research with a question? Your research takes off the rough edges…. I started my research with a question and then changed completely after six months to a new question, new method, new site and a new theory. I’m having this issue with my Masters thesis. The topic I really wanted to do I can’t do because a/ I can’t work under the person who supervises forensic topics and b/ apparently it would be too hard to get through ethics (read not worth the hassle for a Masters dissertation). So I need to find another topic that thrills me and I am having trouble. I have a few I am slightly interested in but I want something I am *really* interested in. Or am I expecting too much? A ‘significant contribution to knowledge’ is not a quantified *thing*. Even where students are ‘lucky’ enough to have limited options regarding the scope and focus of their research project (there are far too many misconceptions about the differences between ‘sciencey’ and ‘other’ research :/), the candidate still has to demonstrate a ‘significant’ ‘contribution’ to ‘knowledge’: something that is Mephistopheles-in-drag even amongst the most quantitative avenues of research. Figuring out what your ‘question’ is seems to be a journey like every other aspect of the PhD experience. So many post-docs tell me that they really only figured out what their question was, in its final form, as they were going through their final throes of rewriting that I’ve come to accept that having the ‘perfect’ question is nonsensical. The point is to *have* a question! clearly stated! that gives focus and direction through the months of meandering. A question for the questing, to guide us through the Mines of Moria: to light our way, a guide in the darkness. There will be times when we’re tilting at windmills. Our guiding question(s) are there to help us find our way back to the Yellow Brick Road. It’s up to us to untangle the metaphors, and make something of our journey: but we need not do it alone. I’m not sure if it is WordPress, or my browser, that fails to keep me logged in between starting a comment, and hitting ‘post’: must remember to check before committing every time. How does one reconcile this meandering quest with the expectations of supervisors and universities? I generally start broad: general discipline or topic. If people are actually interested, I narrow things a little, or tell a brief story. Stories work well, with what, why, and how bundled into a (few) sentence(s). This can also help you think through your question, methodology, methods, and so forth. Love this post! We need to laugh at ourselves and not take our work so seriously. One question though: Without a research question formulated, what do you tell all those nosy/well-meaning but ultimately disinterested people who ask you what you are working on for your PhD? Reblogged this on confessions of a worried teacher. I am not sure my question is clear but my supervisor thinks it fine. I will trust his greater wisdom and experience and move on. If not I will still be coining my question when my funding runs out. My looming deadline is forcing me to leave it as it is. 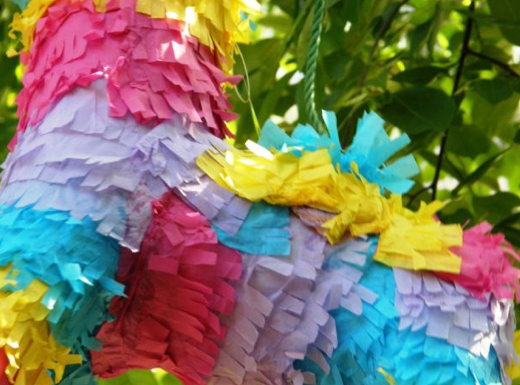 I think another dimension to the challenge is the possibility that the thesis question pinata is unbreakable, not because it’s poorly conceived, but because for various practical/logistical reasons, you just can’t answer it. The damn thing just can’t be broken by you, with the stick that you presently have. My initial proposal looked great on paper, but I simply couldn’t operationalise it because of a difficulty in getting the required data (issues of access, which has become too time consuming to the point that I don’t think it’s worth pursuing). So, at the end of my first year, I’m sort of back to the drawing board, trying to conceive a question that’s related to my first, but one that’s “do-able”. I’m actually in the midst of reverse engineering a question. I’m looking at what kinds of data I know I have access to, and what questions they can answer. The lesson I’ve learnt is to ensure your thesis question pinata doesn’t just look good on paper, but you’ve actually got a chance of breaking it in reality! Thanks for sharing this piece of your research experience, Bob. I think PhD has to be really well connected to every other element of the entire process.